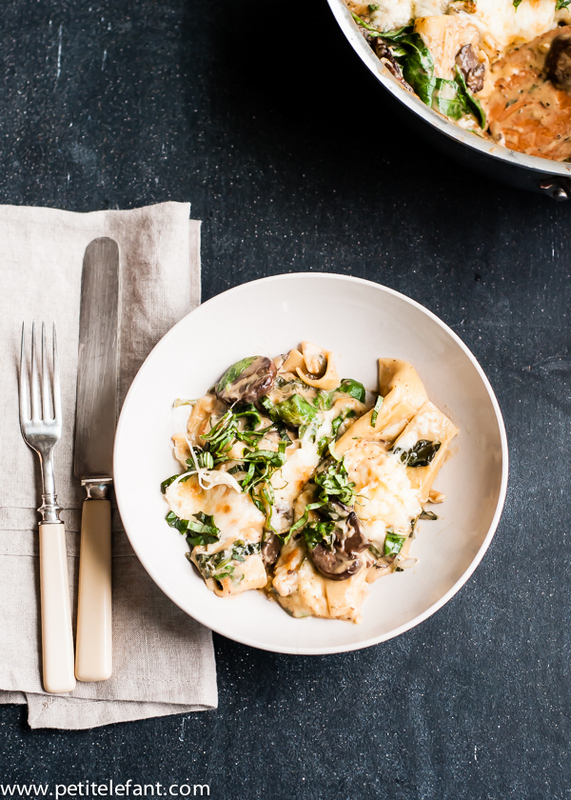 A skillet lasagna, made with mushrooms and spinach? Yes please. It’s a dreamy vegetarian dish made in (nearly) one pot, which means less dishes and easier clean-up. The truth? You need two for this recipe, so it’s almost a one-pot dinner. But you’ll forgive the extra pan when you taste this! It comes together very quickly and makes for an incredible dinner. 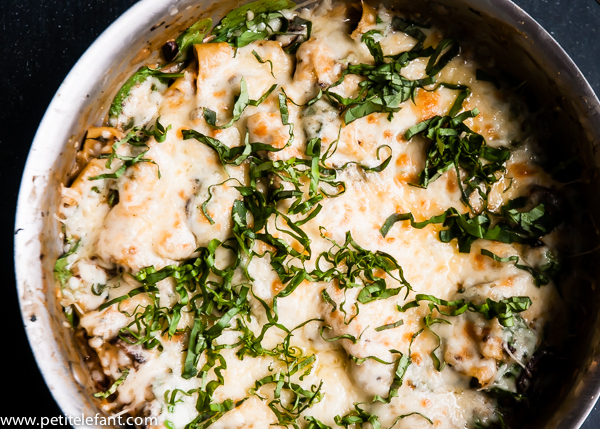 Skillet lasagna is all the rage. I actually did not know this. But it makes tons of sense, right? It’s lasagna that cooks on the stove top in lieu of all the steps and layering everything into a pan and waiting for it to bake. Hey, I’m also looking out for you. 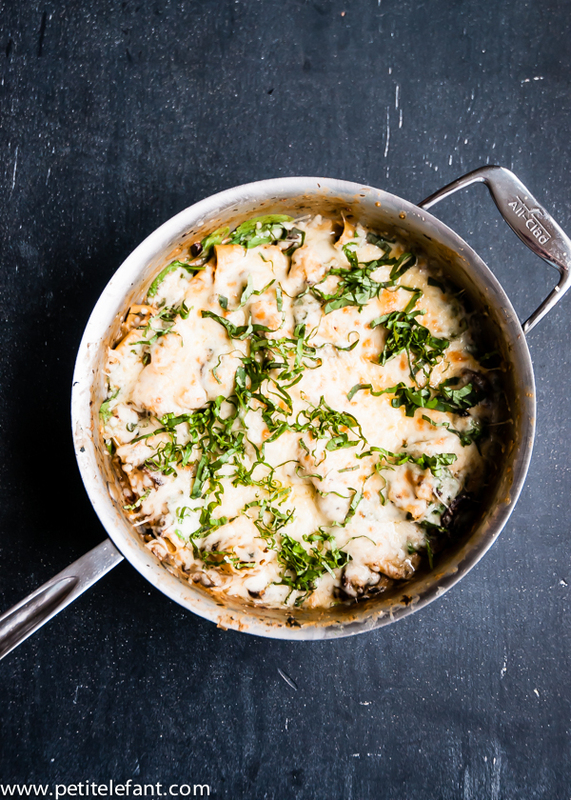 If you want this to truly be a one-pot skillet lasagna, use bottled alfredo sauce. I included a recipe for a quick homemade version that I used for this because my family prefers it to the jarred kind. 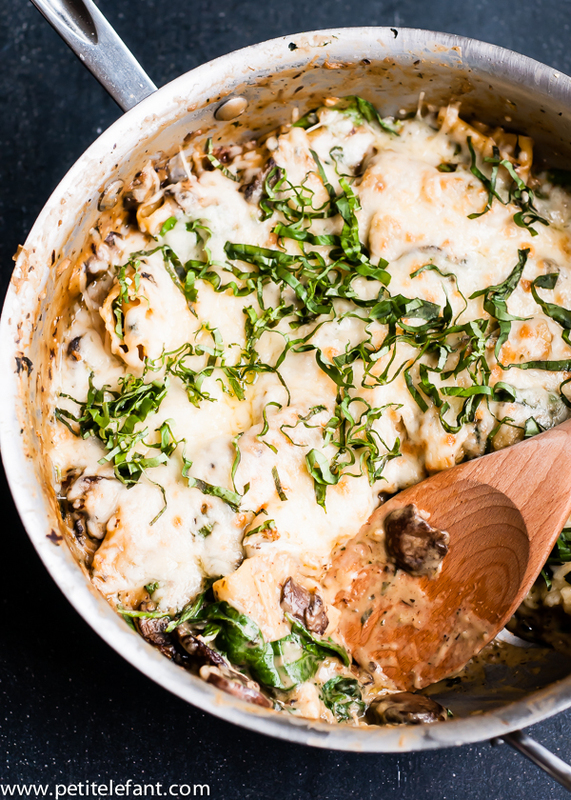 Either way you do it, this skillet lasagna is going to be outrageously yummy. Don’t say I didn’t warn you! 1. Heat a deep 3 to 4-quart saucepan over medium high heat. Add the olive oil and heat until it shimmers, about 30 seconds. Add the onion. Cook, stirring often, until it starts to turn golden and has softened. 2. Next add the sliced mushrooms. They will release quite a bit of liquid as they cook and turn golden brown. This takes about 15-20 minutes. They will reduce by about half in volume. Stir frequently so they don’t burn on the bottom of the pan. If the pan starts to cook dry, add a little bit more oil or water and scrape up the browned parts with a wooden spatula or spoon. 3. Add the garlic and Italian herbs to the pan and cook for a few more minutes. 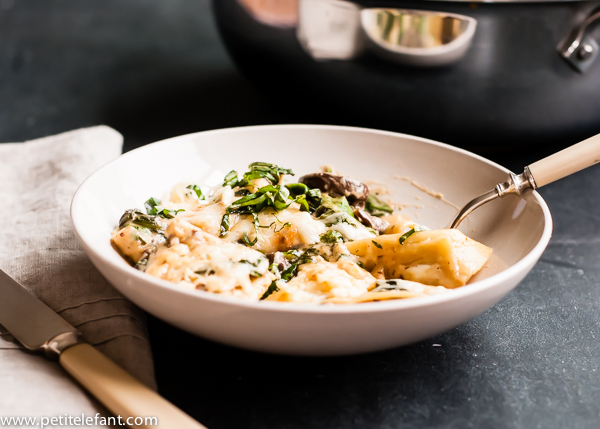 Stir in the alfredo or white sauce (see below). Taste and add salt and pepper, if needed. Bring to a low simmer. 5. When the pasta is still a little undercooked (almost al dente), add the baby spinach. Stir gently to combine. It will start to wilt and lose it’s volume. Add it in two batches if needed so it doesn’t overflow. 6. Sprinkle the cheese evenly over the top. Cover with the lid and turn the heat off. The residual heat will finish cooking the pasta and melt the cheese. 7. For a browned top, place the pan under a hot oven broiler for a few minutes. Sprinkle with sliced basil and serve immediately. Melt butter in a medium saucepan. Whisk in the flour and let cook for 1 minute, careful not to let it brown. Whisk in the milk and cook, stirring or whisking constantly until thickened, about 3-5 minutes. Stir in the cheese a little at a time, whisking well. Taste and add salt, if needed, and the pinch nutmeg. Keep warm until ready to assemble lasagna.